Since the days of the ancient Egyptians in 3500 B.C., games have been a source of education, community, life skills, mental health, and most importantly, fun! Whether you haven’t touched a game in years or you’re a serious gamer, we have just the thing for you. 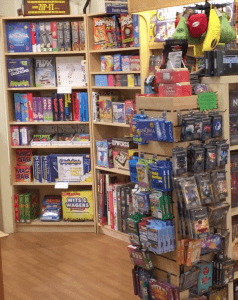 Diversions Puzzles & Games® is proud and excited to carry a wide range of classic, card and board games to meet all of your gaming needs. Gaming with your family or holding a game night with friends? Check out our family/party games, such as Wits & Wagers, Dixit or Qwirkle. Looking to help your child with their development? Try Rush Hour or Scrambled States of America. Want to re-learn or stick with the classics? We have chess, backgammon, checkers and cribbage. Do you like Settlers of Catan and Dominion? We carry hundreds of other titles including 7 Wonders, Machi Koro, Pandemic, and Splendor! Use it or lose it! 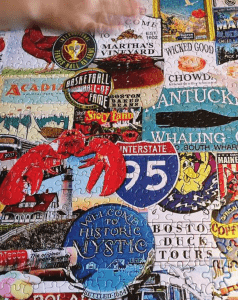 Puzzles are a wonderful way to keep the adult mind young and healthy by working both sides of the brain: stimulate the logical, problem-solving, and analytic left half while fulfilling the creativity and chaos the right side craves. Puzzles jump-start the development of kids by exercising their motor skills, spatial acuity, sense of achievement and more. Diversions Puzzles & Games® has a huge selection of puzzles – small pieces and large pieces, irregularly shaped pieces, wooden pieces, three pieces or thirty-two thousand pieces….animals, landscapes, dragons, quilts, musical instruments, maps, and more! We are proud to offer the following puzzle brands, and we keep adding on! Let’s go fly a kite! Head to the park or beach and let the wind carry these beautiful kites away! Butterfly, Dolphin, Redbeard’s Ship, Sport Kites, Pocket Kites & More! Our selection of books are perfect for a relaxing weekend morning, day at the beach or airplane ride! Choose from a huge selection of brainteasers, crosswords, and more. Bridge, Rummy, Gin, Crazy Eights, Spades….are you a fan of these classic card games? We are, too! Spice up your card game nights with fun playing cards. We carry large print cards, bridge decks, and cards with great designs! Movie posters, vintage planes, comic books, and more! Looking for a gift for a game or puzzle enthusiast? 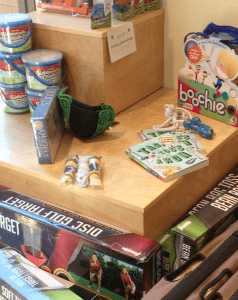 We have fun and unique gifts, perfect for birthdays or the holidays, including specialty mugs, unique cribbage boards, themed trivia games & more!